White Provision Residences offer and exciting new condominium living experience in the hip area of West Midtown. 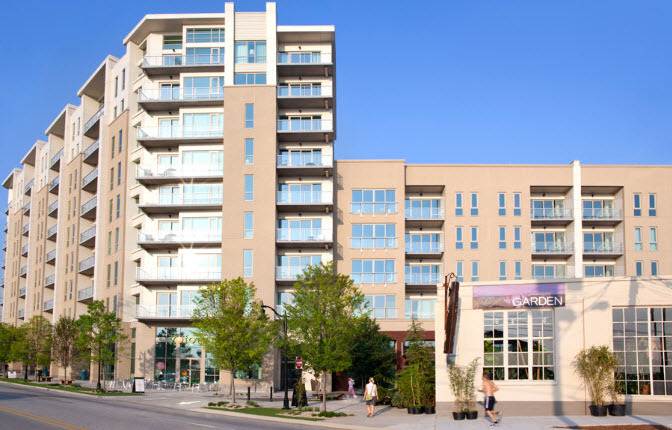 Located at 14th Street and Howell Mill Roads, the entire area around this new building as seen a surge in development of shopping, restaurants and new apartment construction. White Provision is a former industrial meat packing building turned into an ultra cool shopping, restaurants and retail space. The developers saw fit to preserve the historic 1910 brick structure, and while is stands on its own, it blends with the newly constructed White Provision Residences. With fifteen floor plans to select from, White Provision offers a variety of alternatives and views for any Intown Atlanta condominium buyer. One bedroom homes range in size from 814-980 sq. ft; 2 bedrooms are 1140 -1450 sq.ft. ; 2 bedroom +den are 1548-1880 sq. ft. and the Penthouse homes are 2298-2608 sq ft.
Visit our Community Page @ White Provision for more information about this great Midtown West living option! If you are looking to buy or sell in White Provision Condominiums, understanding the market trends will better help you make an offer on a home for sale, or determine your pricing strategy if you are selling your White Provision Condominium. Data last updated: 4/20/19 10:57 AM PDT. If you are looking to Buy or Sell a home at White Provision Condominiums, MyMidtownMojo can help! Selling: Do you want to sell your White Provision Condominium? Call us today at 770.713.1505 to schedule your free market analysis of your home. Or you can complete our Seller Information Form. Are you “upside down” or owe more than your home is worth? If you need to sell your home, you have other options besides a foreclosure, such as short selling your White Provision Condominium. Buying: Are you looking to buy a White Provision Condominium? We can search for you, and even build you a custom website that will alert you daily of any new listings in the building. Just complete our Buyer Information Form and we’ll get to work!